The bodies of a headless goat and a large “bird of prey” were discovered Monday morning by two women walking along the northern edge of Elysian Park overlooking the 5 freeway. One of the women, an Echo Park resident, who was walking her dogs, said they came across the black-and-white body of what appeared to be a baby goat. Nearby was the body of a large bird – “with talons nearly as big as my fist” – that also had its head severed, the woman said. Both animals appeared to have been killed recently, said the woman. The two women notified two officers of the animal remains. 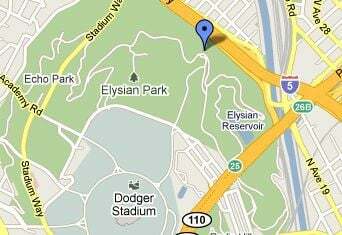 The bodies are the most recent animal remains to have been found in Elysian Park over the years, including a heart and other parts of a pig discovered last month. * Correction: A previous version of this post said the bodies were discovered near Grand View Point. But, after reviewing the map, one of the women who found the animal remains said they were located near an overlook that was further north near Elysian Park and Solano Canyon drives.